Sadly, my sister-in-law Debbi’s father passed away on Tuesday. Dave was a quiet, kind, and intelligent man with many impressive achievements. It was always nice to see him at family gatherings and when he wasn’t up to coming he always put in a hello to everyone. He and Debbi’s mom were a wonderful couple with a true love story. My sincere condolences to you, Deb. May you take comfort in knowing you now have two angels watching over you. My dad passed away on Tuesday 6/12 after a brief hospital stay following a heart attack on Fri. 6/8. 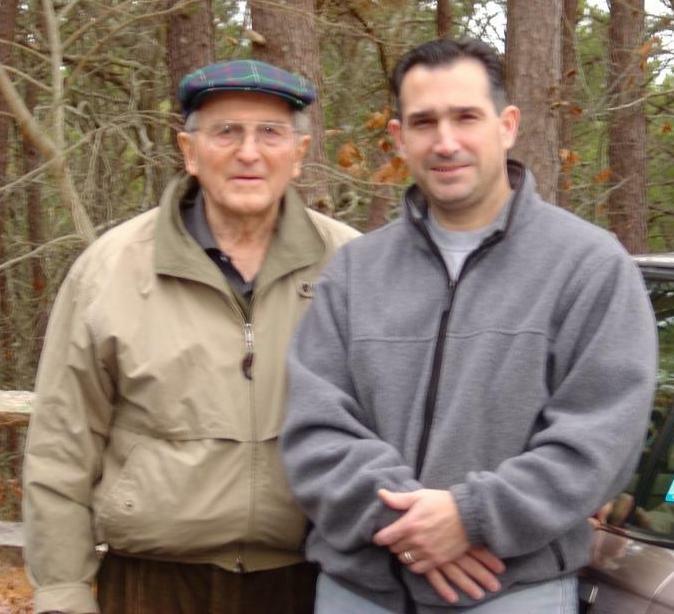 He did very well up to this point and was with me here in NJ for 5 1/2 years. He had turned 87 in April. We had just been out to lunch the Tues. before he went into the hospital, and we did errands and had our usual outing. All he wanted, at this point, was to be with my mom who passed 10 years ago. He is with her now. My friend, Tania dreamt that there was a mountain with mist coming over the top, and she saw my parents dancing together. The look on my father’s face was one of contentment and such joy. My parents met in junior high and were in the same ballroom dancing class at the age of 14. They kept up their dance lessons until my mom was ill in the very late ’90’s. My dad is pictured on my FB page with Paul. I am grateful I had him for so long and I will miss him. Wellen G. Davison 1925 – 2012 BASKING RIDGE, NJ Wellen G. Davison, 87, a Springfield, MA resident from 1939-2007, died Tuesday at Morristown Memorial Hospital in Morristown, NJ. Born April 20, 1925 in Greenville, Ohio. He was the son of the late Bloice and Corabelle (Gilbert) Davison. Moving to Springfield in 1939, Wellen graduated from the former Classical High School with the class of 1943. He served in the Army Air Corps during World War II and was a 1st. Lieutenant in the 8th Air Force. Following his return from military service, Wellen continued his education, receiving his BS in Mechanical Engineering from Worcester Polytechnic Institute in 1949. He later received his MS in Mechanical Engineering from Rensselaer Polytechnic Institute in 1961 and his PhD in Mechanical Engineering from the University of Connecticut in 1972. His career began with Westinghouse Electric Corp from 1949 to 1958 where he was Senior Design Engineer. In 1951 he began his career with Western New England College (now Western New England University) in Springfield, MA serving as evening faculty until 1958 and as full time faculty from 1958 to 1989 retiring as Professor Emeritus. He was a member of Sigma XI, Sigma Beta Tau and Phi Tau Sigma (Honorary Engineering Societies), was a Fellow Member of the American Society of Mechanical Engineers, a Member of the Engineering Society of Western Massachusetts, was in the WNEC Engineering School Hall of Fame, received the Dedicated Service Award-ASME, and was also a member of the former Old First Church Court Square for over 50 years where he served on the Board of Trustees, and Property Committee. He was predeceased by his wife the former, Elizabeth Stephens Pratt in 2001, they had married in1947. He is survived by his daughter, Deborah D. Antinori and her husband Paul of Basking Ridge, NJ; and his sister, Joyce Higginbotham of Granbury, TX. A celebration of Wellen’s life will be held Friday, 6/15/12, 10:30am at Dickinson-Streeter Funeral Home, 305 State St., Springfield. Burial will be in Hillcrest Park Cemetery, Springfield, and followed by lunch at Salvatore’s Restaurant, 1333 Boston Rd. Memorial contributions may be made to Western New England University School of Engineering. Thanks so much, Joe and Jane. He truly wished nothing more than to be with my mom. He liived a good long life and left quickly. I will miss him, but I am relieved his sadness has come to an end and he is now with my mom and buried in his beloved Springfield. I am so sorry to hear that your father is gone, Deb. You were a good and faithful daughter to him and it was clear that he was very sad for the past few years. Wish we could be there with you.